It’s impossible to overstate the importance of employing proper disinfection procedures in the salon. After all, poor sanitation can cause infections to spread among clients, potentially resulting in a devastating lawsuit that could destroy your business altogether. Unfortunately, according to Janet McCormick, cofounder of Nailcare Academy in Fort Myers, Florida, many techs are cutting corners when it comes to these crucial practices, such as mixing disinfectant solutions. “If you’re not measuring or mixing solutions properly, you might as well not be doing anything,” she stresses. “I think there are more techs doing it right than 20 or 30 years ago, but I’d estimate that 40 to 50 percent are still taking shortcuts.” Here’s what you need to know to make sure that your salon’s sanitation standards are up to snuff. Today, many salons keep services safe by using single-use implements made of porous materials, such as wood or cotton, that are disposed after each client’s service. But nonporous implements made of stainless steel or hard plastic must be thoroughly cleaned and then disinfected after each use. “Cleaning is the first step of the disinfection process; it reduces pathogens by 99 percent, but it doesn’t disinfect,” notes Kent Jones, director of business development for Virox Technologies in Oakville, Ontario, Canada. McCormick clarifies that cleaning should entail brushing the implement with soap and water, rinsing it and then finally drying it—a crucial step to avoid diluting the disinfectant, rendering it less effective. “Prep is one of the most important steps; don’t simply drop the implement in disinfectant,” she says. “When you do that, microbes with an oily covering will not be attacked by the disinfectant.” Then, follow the instructions on the disinfectant you use. They usually require an 8- to 10-minute immersion time. Keep in mind that there are low, intermediary and high levels of disinfectant. Milica Petkovic, director of marketing for Virox, notes that Barbicide, for example, requires changing every day, while high-level disinfectants can last for 21 days. Adding to the confusion, state board regulations vary. “For nail tools that may come in contact with broken skin or blood, such as clippers, nippers and pushers, a high-level disinfectant is appropriate,” says Siobhian Sweetingham, technical marketing specialist for Virox. “But most states require only a medium- level disinfectant for these.” Finally, if mixing is required, measuring proper ratios is key; don’t simply estimate amounts or rely on visuals to guess the correct mix. For surfaces such as manicure tables, chairs, sinks and floors, Virox outlines a four-step disinfection process: Remove any dirt and debris first; thoroughly wet the surface with a spray disinfectant or presoaked disinfecting wipe; allow the solution to remain wet on the surface for the recommended time on the product label, reapplying if needed; and allow the surface to air-dry or wipe with a clean cloth. 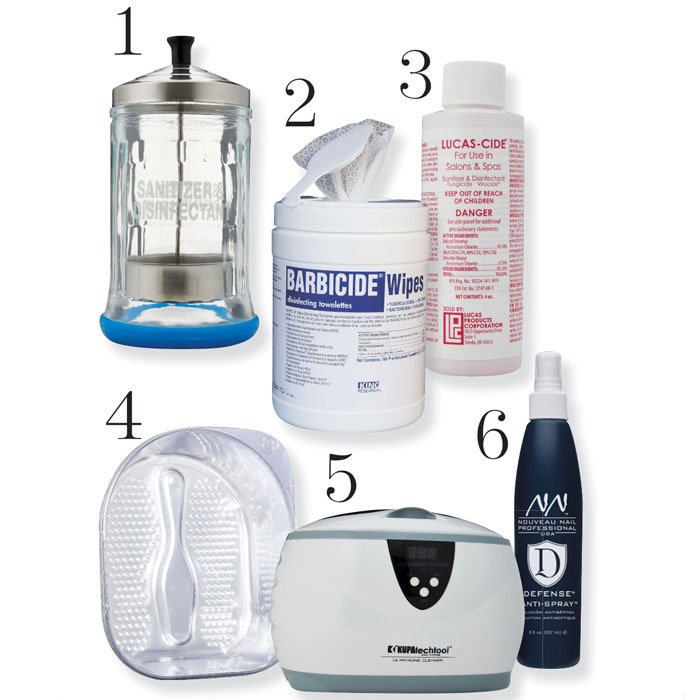 Though disinfection seems straightforward, experts lament the improper procedures practiced in many salons. Petkovic has witnessed many using household-type products for their surface disinfection, but these won’t achieve the desired results, she says. “Most dry within the required 10 minutes, so you must use professional products,” she explains. “And even though our products kill 30 pathogens in one minute, you must leave the product on for the full 10 minutes for complete disinfection.” Finally, be sure to clean all surfaces between clients to prevent the spread of everything from flu to fungus. And don’t overlook those oft-touched areas, like the reception desk and door handles! Pedicure tubs have certainly gotten the worst rap in the salon setting for being breeding grounds for infection, leading to well-publicized cases of illness and even death in years past. Jones points out that these concerns have provoked a movement toward noncirculating (pipeless) footbaths, though many salons still work with circulating models. Sanitation procedures are different for each, and there are two processes to follow: one for after each client and another for end-of-day disinfection. 1) Drain all water from the basin. 2) Scrub all visible residue from the inside walls of the basin with a brush, liquid soap and water. Use a clean and disinfected brush with a handle. Brushes must be cleaned and disinfected after each use. 3) Rinse the basin with clean water. 4) Refill the basin with clean water, and circulate the correct amount (read the label for mixing instructions) of the Environmental Protection Agency (EPA)-registered hospital disinfectant through the basin for 10 minutes. 5) Drain, rinse and wipe the basin dry with a clean paper towel. 1) After draining water from the basin and removing visible debris, remove the filter screens, jets and all other removable parts from the basin. Clean the screen and other removable parts and the area behind these with a brush, liquid soap and water to remove all visible residue and replace the properly cleaned screen and other removable parts. 2) Fill the basin with warm water and chelating detergent (cleansers designed for hard water) and circulate the spa system for 5 to 10 minutes (follow manufacturer’s instructions). If excessive foaming occurs, discontinue circulation and let it soak for the remainder of the 10 minutes. 3) Drain the soapy solution and rinse the basin. 4) Refill the basin with clean water and circulate the correct amount (read the label for mixing instructions) of the EPA-registered hospital disinfectant through the basin for 10 minutes. 5) Drain, rinse and wipe dry with a clean paper towel. 1) Do not drain the disinfectant solution—turn off the unit and leave the disinfecting solution in the unit overnight. 2) In the morning, drain and rinse. 3) Refill the basin with clean water and flush the system. 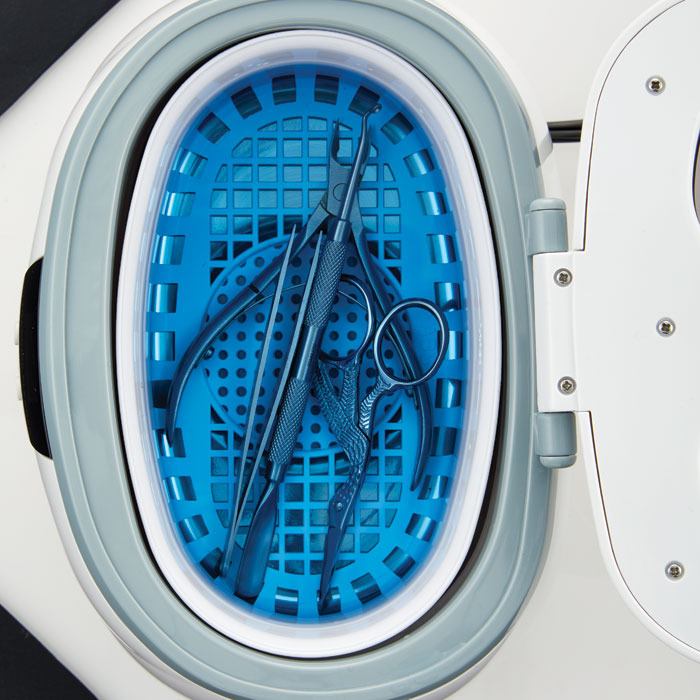 Noncirculating footbaths have a more streamlined procedure after each client, according to the NMC. Simply drain the basin and remove any visible debris, clean the basin with a clean brush and detergent or disinfectant, rinse and drain. Refill the basin with clean water and the correct amount (read the label for mixing instructions) of the EPA-registered hospital disinfectant. Leave this disinfecting solution in the basin for 10 minutes. Drain, rinse with clean water and wipe dry with a clean paper towel. Following these sanitation guidelines will help safeguard your clients’ health and the health of your business. If you’re going the extra mile to practice proper disinfection procedures, make sure to let your clients know by publicizing it on your website and in the salon so they feel confident in choosing your business over the competition.